WILLIAM TECUMSEH SHERMAN. 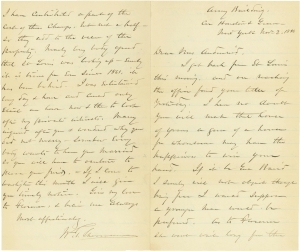 Five Autograph Letters Signed to Mrs. Mary Audenried, widow of Sherman’s former Chief of Staff. 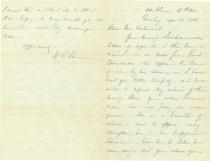 18 pages, April 21, 1885 – February 8, 1887. William T. Sherman (1820-1891), a West Point graduate and Mexican War veteran, served as a corps commander under General Grant in successful Union campaigns down the Mississippi and in Tennessee, then took command of the western armies when Grant was reassigned to the Virginia theatre of war. His capture of Atlanta and subsequent “March to the Sea” through Georgia, was followed by a swift campaign north through the Carolinas to force the surrender of the last major Confederate army. He was Commanding General of the U.S. Army from 1869-1883. In 1850, 30-year-old William T. Sherman married 26-year-old Ellen Boyle Ewing (1824-1888); they had four daughters and four sons. Mary Colket was 18 when she married 24-year-old Joseph C. Audenried in 1863. In 1867, they had a daughter, Florence. Audenried was a staff officer with General Grant at Vicksburg and General Sherman to Atlanta and on the “March to the Sea.” He remained with Sherman for the rest of his life, in the Indian Wars in the West and then on to Washington when Sherman became Commanding General. Col. Audenried was 41 when he died in 1880. In “Citizen Sherman: A Life of William Tecumseh Sherman” (Random House: New York, 1995), biographer Michael Fellman writes of an affair between Sherman and Col. Audenried’s widow, 25 years younger than the General. 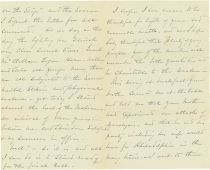 The earliest of these five letters was written by the 65-year-old married General to the 40-year-old widow in 1885. Sherman’s wife was 64 when she died in 1888. 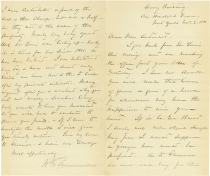 Autograph Letter Signed (“Affectionately / W. T. Sherman”), 4 pages, 5-1/2” x 9-1/4”. Army Building, New York, December 29, 1886. 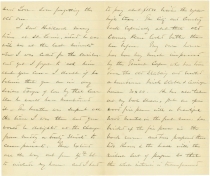 “I was in doubt of General Logan’s funeral. 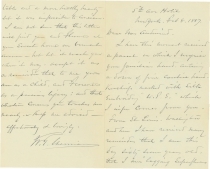 Now I am advised by John Sherman vice Prest and Jno. A. Logan Jr. that I am honored as one of the Pall Bearers and that the ceremonies will be in the Senate Chamber Friday Dec 31 at Noon…Florence arranged for the visit to Mrs [Grover] Cleveland…Genl Baird is a gentleman who is free to court any woman- Mr. Reed is embarrassed by a wife and his marked attentions will not be as favorably construed by a scandal loving world…” General John A. Logan had died at the age of 60 three days earlier. 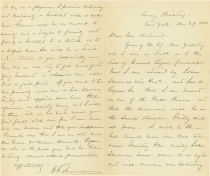 In this letter, General Sherman has promoted his younger brother John to Vice President. When Vice President Thomas Hendricks died in 1885, Ohio Senator John Sherman, President Pro Tempore of the Senate, took over the Vice President’s only constitutional duty, that of presiding over the U.S. Senate, and physically moved into his office; Sen. Sherman was never Vice President. 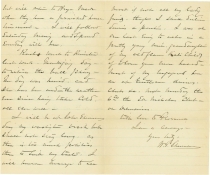 Autograph Letter Signed (“Affectionately & lovingly / W. T. Sherman”), 4 pages, 5” x 8”. 5th Ave Hotel, New York, February 8, 1887. 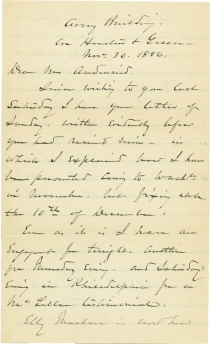 On his 67th birthday, Sherman recognizes Mrs. Audenried’s handwriting on a parcel he has received “containing a dozen of fine Cambric handkerchiefs marked with silk embroidery ‘W.T.S.’ which I infer comes from you…As we say in the army the lightning has struck very close several times: [U.S.] Grant, [George B.] 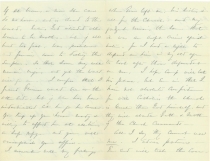 McClellan, [John A.] Logan, [William B.] Hazen…and [Charles P.] Stone all younger men than me, all subjected to the same mental strain and physical weakness – yet today I stand almost the last of the Mohicans, an interval of eleven years existing between me and [Philip H.] Sheridan, [John M.] Schofield & my successors in office. Well! – so it is and all I can do is to stand ready for the final call. 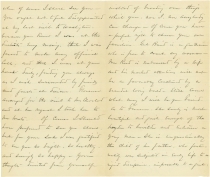 I confess I have reason to be thankful for length of years, and reasonable health, and am I hope duly thankful that plenty of young people, you of the number, will remember the better qualities and be charitable to the weaker.” General Grant, 63, and General McClellan, 58, had died in 1885. Now, within a month of each other, Generals Logan, 60, on December 26th, Hazen, 56, on January 16th, and Stone, 62, on January 24th, each younger than he was, died and Sherman reflects on his own mortality. He realizes that there aren’t many of his Civil War comrades still living and that he was 11 years older than Generals Sheridan (who died 18 months later at 57) and Schofield (who died at 74 in 1906). Sherman’s “final call” was in 1891, six days after his 71st birthday.